There are times that you know the truth but fear keeps you from sharing it. Sharing truth in love can change the world. Every two years, Mars and other planets appear to do a loop in the sky. They appear to move forward then backwards, and then forward again. The shape of the motion looks like the ribbons you see on people’s lapels that help us to remember a cause. This planetary motion is called retrograde and it perplexed ancient astronomers and philosophers for centuries. Ptolemy was a mathematician and astronomer. He depended on Aristotle’s Physics. Ptolemy presupposed that the earth was at the center of the solar system. To explain the loopy retrograde of the planets, he imagined a Spirograph-like circle going round-and-round, looping around itself, and circling Earth. Ptolemy’s description of the solar system made sense to the ancients. After all, it was proposed, since humans being are the greatest of all of God’s creation, why wouldn’t Earth be at the center of it all? However, as observational evidence deviated from simple circles, more explanations were developed. As he kept adding circles to account for differing planetary motions, Ptolemy’s solar system became quite complex. Ptolemy’s thoughts pervaded for over 1,000 years. In the 1500s, Nicholas Copernicus found a simpler way to explain planetary motion. He read the ancient Greek astronomer, Aristarcus. Like Aristarchus, Copernicus stated that the Sun is at the center of the solar system and planets circle the Sun. 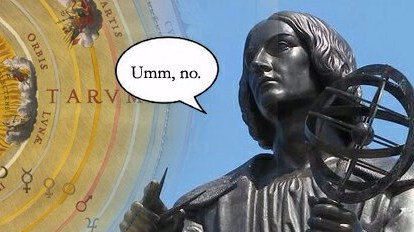 Now, Copernicus loved God and his church and, despite his findings, he was skittish to share them. He did so, at first, anonymously. When he finally did share publicly, neither the Pope nor Luther believed him. After all, Luther reasoned, Joshua stopped the Sun, says Scripture. In the end, in 1543, Copernicus published his findings in his book called, On the Revolutions of the Celestial Spheres. Unfortunately, Copernicus died the year it was printed. The first copy was laid in his hands on his death bed. Copernicus shows us that changing the paradigm of pervading thought is difficult and takes time. So don’t be afraid to share truth in love but share truth wisely and at the right time. Is there a truth you need to share with family or friends? Is it the right time to share? Sharing truth is difficult. Sharing truth in love can change lives forever. A truth sandwich is best served with love, then truth, then love again. Previous Eclipse: God Judgment or God’s Glory?